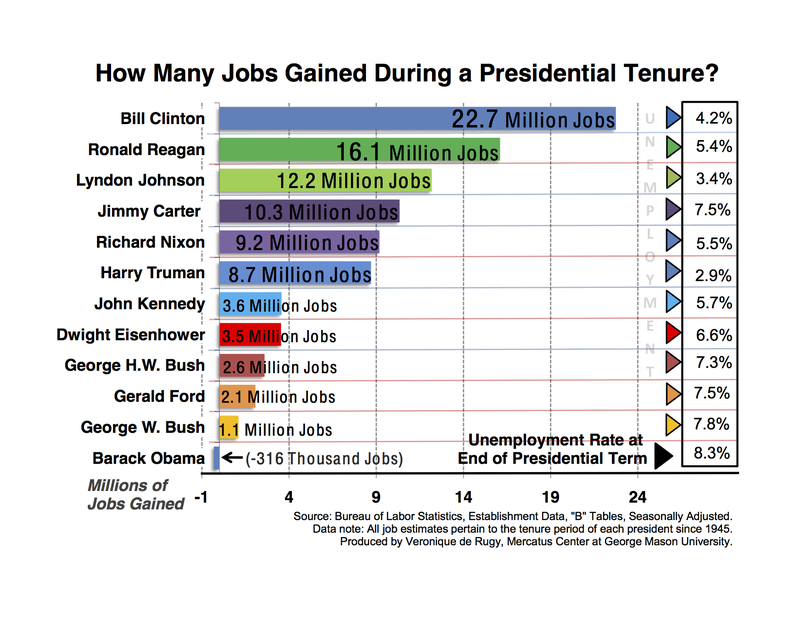 How Many Jobs Gained During a Presidential Tenure? Polls show over and over again that jobs are a major concern for Americans. While presidents don’t create jobs, their policies can influence the direction of the economy. Presidents can create an environment that is more or less conducive to job creation—hence, the close scrutiny of employment statistics during presidential campaigns. This chart uses data from the Bureau of Labor Statistics (BLS) Employment Tables to show the number of jobs gained during each presidential tenure since 1945. This chart isn’t meant to compare President Obama (who’s completed just under one term so far) to President Clinton (who completed two terms.) Rather it is meant to look at how each president did during their tenure. Also, considering that population grows and labor participation varies over time, this data is probably slightly biased in favor of President Obama for both the job numbers and unemployment rate. Although President Obama has not yet finished his first term, the data show that it would take him roughly 280,000 new jobs per month for every month from now until January 2013 to get him out of last place. Presidents Clinton and Reagan saw the highest gains in jobs and maintained some of the lowest unemployment rates during their administrations. Veronique de Rugy further explains these job gains at NRO’s The Corner. The estimated job changes take into account the year-to-year changes in employment, typically from January to January (unless the president left office earlier or later). Presidents Truman, Eisenhower, Bush, Reagan, and Clinton served two terms; Presidents Obama, Ford, and Kennedy served less than a full four-year term. Thus, any conclusions should take note of these terms. Lastly, the data comes from the BLS “B” Tables, which are data taken from payroll records of a sample of nonagricultural business establishments.